^ "Encyclopedia definition of alpha version". ^ "Beta Test Management Glossary" (PDF). Centercode Asset Library. ^ "Technology Preview Features Support Scope". ^ #328 (May 13, 1996)"TidBITS"Waiting with Beta'd Breath . Archived from the original on 2006-05-15. ^ "Google Apps is out of beta (yes, really)". Google Blog. 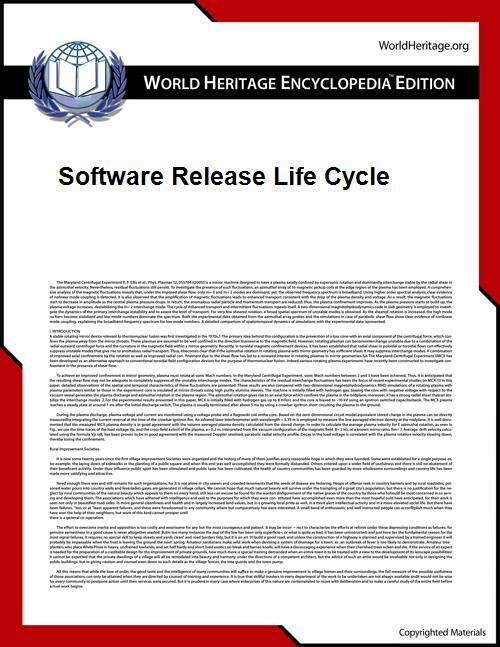 During its supported lifetime, software is sometimes subjected to service releases, or service packs, sometimes also called "interim releases". For example, Microsoft released three major service packs for the 32-bit editions of Windows XP and two service packs for the 64-bit editions. Such service releases contain a collection of updates, fixes and enhancements, delivered in the form of a single installable package. They may also implement new features. Some software is released with the expectation of regular support. Classes of software that generally involve protracted support as the norm include anti-virus suites and massively multiplayer online games. A good example of a game that utilizes this process is Minecraft, an indie game developed by Mojang, which features regular "updates" featuring new content and bug fixes. General availability (GA) is the marketing stage at which all necessary commercialization activities have been completed and a software product is available for purchase, depending, however, on language, region, electronic vs. media availability. Commercialization activities could include security and compliance tests, as well as localization and world wide availability. The time between RTM and GA can be from a week to months in some cases before a generally available release can be declared because of the time needed to complete all commercialization activities required by GA. At this stage, the software has "gone live". The term "release to manufacturing", also known as "going gold", is a term used when a software product is ready to be delivered or provided to the customer. This build may be digitally signed, allowing the end user to verify the integrity and authenticity of the software purchase. A copy of the RTM build known as the "gold master" or GM is sent for mass duplication. RTM precedes general availability (GA), when the product is released to the public. A release candidate (RC) is a beta version with potential to be a final product, which is ready to release unless significant bugs emerge. In this stage of product stabilization, all product features have been designed, coded and tested through one or more beta cycles with no known showstopper-class bug. A release is called code complete when the development team agrees that no entirely new source code will be added to this release. There could still be source code changes to fix defects, changes to documentation and data files, and peripheral code for test cases or utilities. Beta testers, if privately selected, will often be credited for using the release candidate as though it were a finished product. Beta testing is conducted in a client's or customer's location and to test the software from a user's perspective. On December 29, 2014, all owners of Halo: The Master Chief Collection for the Xbox One were able to download and play the Beta of Halo 5: Guardians for free through January 18, 2015. Users of the Beta were reminded via in-game popup that the release was a Beta and may contain some glitches and were encouraged to communicate them through the Halo series online community. As the Internet has facilitated rapid and inexpensive distribution of software, companies have begun to take a looser approach to use of the word "beta". In February 2005, ZDNet published an article about the recent phenomenon of a beta version often staying for years and being used as if it were in production level, disparagingly called "perpetual beta". It noted that Gmail and Google News, for example, had been in beta for a long period of time and were not expected to drop the beta status despite the fact that they were widely used; however, Google News did leave beta in January 2006, followed by Google Apps, including Gmail, in July 2009. This technique may allow a developer to delay offering full support and responsibility for remaining issues. In the context of Web 2.0, people even talk of perpetual betas to signify that some software is meant to stay in beta state. Also, "beta" is sometimes used to indicate something more like a release candidate, or as a form of time-limited demo, or marketing technique.